Wat Saket stands just outside the second canal ring, the Banglampu-Ong-Ang Canal with its prominent gold chedi overlooking the city. Construction started in the reign of King Rama III, but was only completed in 1865 after his death. 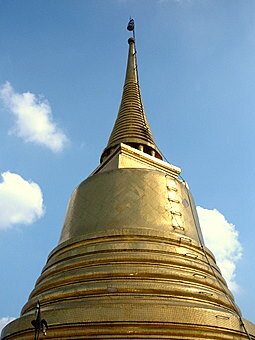 The difficulties in construction arose because the Golden Mount, 100 m high and 500 m in diameter, is actually an artificial hill, reminiscent of an old temple in Ayuthaya. 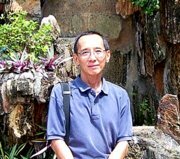 The early stages of construction, in the reign of King Rama III, were bogged down with problems of collapsing soil and the project was abandoned. 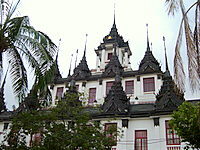 In 1865, during the reign of King Rama IV, the mount was raised by a laborious reinforcement of thousands of logs; before the chedi and gallery were built on top. The finishing touches to Wat Saket were made in the reign of King Rama V.
It's mind-boggling to think of the sheer effort involved to raise the Temple on the Golden Mount. Wat Saket is set in a quiet area, with the main chapel, viharn, monastery library and the monks' quarters in a huge sprawling complex at the foot of the mount. A road runs around base of the mount where the remains of the dead are kept in vaults. Candle processions are made around the mount during religious festivals. The slopes of the Golden Mount are covered by thick foliage showered with bright red flame of the forest. The route to the top is up a long flight of tree-lined steps with platforms along the way for rest areas. As the climb progresses above the treetops, the old city gradually comes into view. The walk to the top takes about 320 steps to the entrance of the chapel. 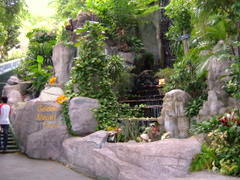 The first level in the circular chapel is lined with Buddha statues of various sizes; Chinese deities are also represented. 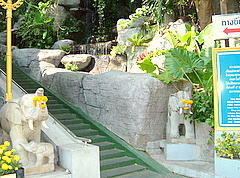 A popular altar is the one with eight Buddha statues, one for each day of the week and one for the night. 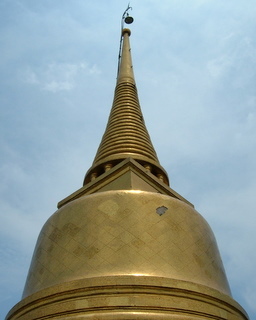 In an elevated inner room in the center, there's a smaller version of the gold chedi at the top of the temple. 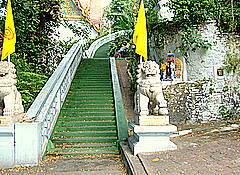 A spiral staircase goes up to the gallery at the top of Wat Saket, the site of the massive gold chedi for which the temple is famous. 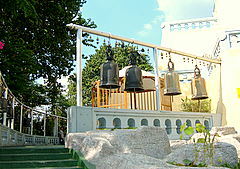 Two revered Buddha relics were interred here. King Rama V interred the first in 1877. The second was believed to the the remains of Buddha discovered in Nepal and presented to King Rama V by Lord Curzon, Viceroy of India in 1898. 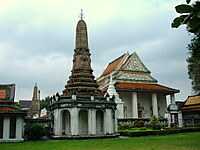 These were interred in the gold chedi in the following year. The gallery at the top of Wat Saket has a panoramic view of the neatly laid-out temple complex below and the congested old city, making it worth the long, arduous climb up. The way down was far easier though, taking just about 274 steps. Unless my mind was playing tricks on me. At the end of the Buddhist Lent sometime in late October, devout Buddhists partake in an annual ceremony with traditions that date back to early Bangkok. Devotees carry a long red banner above the heads and make a procession up the 320 steps to the Temple on the Golden Mount. 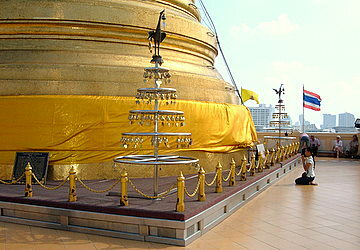 The banner is taken to the top of the mount and wrapped the base of the chedi containing relics of Buddha. 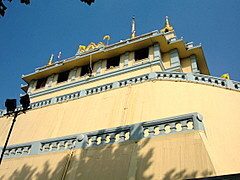 Wat Saket, like Wat Ratchanatdaram and Wat Thepthidaram, is located near the Fort Mahakarn juntion. 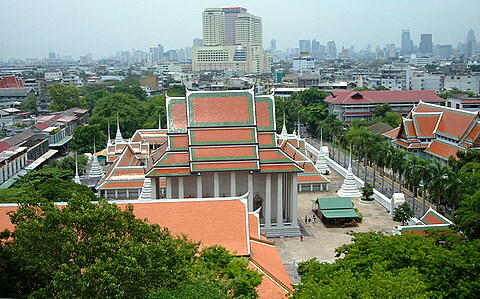 The entrance to Wat Saket is at Boriphat Road the road along the east bank of the Banglampu – Ong Ang Canal. 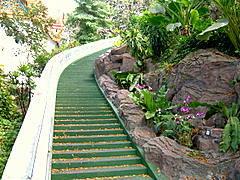 If you have the energy after climbing all those steps, visit all the other attractions in the vicinity. Or you should keep this place till last.